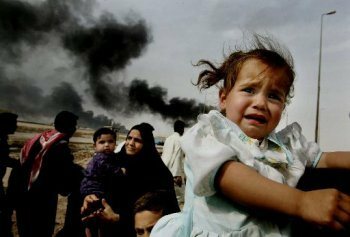 At least 116,000 Iraqi civilians and more than 4,800 coalition troops died in Iraq between the outbreak of war in 2003 and the US withdrawal in 2011, researchers estimate. Its involvement in Iraq has so far cost the United States $810 billion (625 billion euros) and could eventually reach $3 trillion, they added. The estimates come from two US professors of public health, reporting on Friday in the British peer-reviewed journal The Lancet. They base the figures on published studies in journals and on reports by government agencies, international organisations and the news media. “We conclude that at least 116,903 Iraqi non-combatants and more than 4,800 coalition military personnel died over the eight-year course” of the war from 2003 to 2011, they said. “Many Iraqi civilians were injured or became ill because of damage to the health-supporting infrastructure of the country, and about five million were displaced.